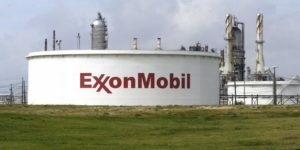 U.S. oil giant Exxon Mobil’s headquarters in Lagos has been shut down, after protesters besieged the company’s offices, protesting the sacking of 150 Nigerian workers. The standoff is coming on the heels of a similar development on Wednesday in Upkenekang Community in Akwa Ibom, where angry youths disrupted the operations of the company over the sacking of contract workers from the area. Members of the Petroleum and Natural Gas Senior Staff Association of Nigeria (PENGASSAN), numbering over 1,000 members, barricaded entry points to the company with boats, coffins, leaves and placards, having different inscriptions. The Chairman of the ExxonMobil Branch of PENGASAN, Paul Eboigbe, confirmed the closure of the company’s Lagos office, adding that the management of the company issued sack letters to workers, while negotiations were still going on. “This is just the beginning of our strike against injustice inflicted on our members working with international oil companies,” he said. “Our members now wear red clothes and put leaves on their trucks to show the injustice by these people. We have resolved to commence strike next year if government does not find a solution to the exploitation by international oil companies,” he added. Posted by Pawla Nibramich on December 16, 2016. Filed under Finance, Zoom. You can follow any responses to this entry through the RSS 2.0. You can skip to the end and leave a response. Pinging is currently not allowed.